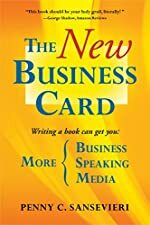 The New Business Card: Write and publish a book to attract more business, more media and more speaking engagements! Are you ready to grow your business in 2018? Are you tired of throwing money at traditional advertising strategies without any real results? It’s time to expand your market and grow your business by publishing a book that highlights your expertise and works as your 24/7 sales tool!